The European Investment Bank (EIB), Societe Generale, and Brittany Ferries today announced that the liquefied natural gas (LNG)-powered newbuild Honfleur will be the first recipient of EIB's financial support under the €750 million ($879.88 million) Green Shipping Guarantee (GSG) programme. Societe Generale acted as the main arranger of the €142.6 million ($167.29 million) financing for the acquisition of the Brittany Ferries-comissioned Honfleur ferry, including a tranche of €49.5 million ($58.07 million) fully guaranteed by the EIB. "Brittany Ferries is doubly proud today," said Jean-Marc Roué, Chairman of Brittany Ferries' supervisory board at the signing ceremony yesterday at the Ministry for Europe & Foreign Affairs in Quai d'Orsay in Paris. "It is the very first shipping company to benefit from the framework agreement concluded in 2016 between the EIB and Société Générale, under the GSG Programme, thanks to the Juncker Plan and the CEF. But also, thanks to this financing it becomes the first French passenger transport company to pave the way towards energy transition using LNG." 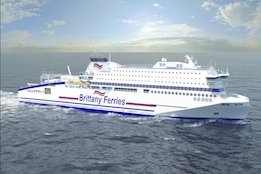 As Ship & Bunker has reported, Brittany Ferries says its Honfleur - which is scheduled to enter into service in April 2019 on the Caen-Ouistreham, France and Portsmouth, UK route - will become will be "the most environmentally friendly ship regularly operating in UK waters." EIB Vice-President Ambroise Fayolle, commenting on the new support, said: "by structuring riskier financing in a new sector, the bank of the European Union strongly reaffirms its commitment to sustainable, responsible and sustainable growth on an international level. Our goal is to support the efforts of French shipowners to develop a more environmentally friendly maritime transport thanks to an adapted and attractive financing tool." Hainan refinery delivers 2,200 mt to Ningbo, according to state media.